🌻 But I did participate on a conference where I presented my essay that had as subject Victorian representations of drowned falling woman - Drowned Angels & Water Graves: Representations of Female Suicide in Victorian Art was the title. 🌻 Confession time. I've been staring at all the comments wondering how I'm going to reply to them all. Sorry for the delay! I promise I'll do it soon. 🌻 Blaze Publishing rep search alert! I received an e-mail asking me if there was someone I could recommend to be an ebook rep for them. If you would like to become and would like me to give them a word,just say it. 🌻 I've reached 43,493 words on my NaNoWriMo project. I'm going to share an excerpt with you - don't be too mean. "Hot blood splattered her face. For a brief moment, she though it was her own blood, but the pain never came. The monster hadn’t torn her neck apart. Slowly, opening her eyelids, she realized the blood belonged to her assaulter. He didn’t look monstrous anymore. The all consuming blackness in his eyes was gone. They were human once again. Black blood oozed from his slashed throat. His fingers slipped away from her as he tried to stop the bleeding. There was nothing he could do. He was choking in his own blood. Jack or Jackson-or whoever or whatever he was-hit with both his knees on the ground. Out of the blue, he was set on fire. Stunned, Perrin could not swerve her attention from the flames. In a matter of seconds, his body turned into ashes." A book that I can't wait to get my hands on is The Cruel Prince by Holly Black. So jealous of everyone who received a review copy. Anyway, I haven't read any of her books before. Any recommendation? Which books/series should I read while I'm impatiently waiting for this one? I really need to take a look at Holly Black's novels. People say so many wonderful things about her books. Aww, thank you. I still don't know how I convinced myself of share this part of my project. Well I work ahead of time and I stay at home with my son. That is how I keep things going on my blog. Staring at comments sounds familiar though, haha. I can't always keep up with the comments, let alone get new blog posts out! It's been a rough year for me, blog-wise. Oh, well, 2018 is coming. Hopefully, 2018 will be better for both of us. There were a couple of months here that I didn't share a single post. True, the most important is that we've fun blogging - but, sometimes, I wish I had more time to give the attention to so many blogs deserve it. Your excerpt is good!! I didn't get The Cruel Prince either. :( I want it so badly too. Enjoy your week. Replying to comments and writing blog posts when you're busy is super daunting. But don't pressure yourself - do a little bit when you can, and you'll get there. And I also find that if I have a free day I'll use the time to write a number of posts, then schedule them for when I'm busy. That way I can spread them out and get some activity on the blog. The Darkest Part of the Forest is an amazing Holly Black book! You should read that one! If you love magical realism and dark fantasy, you'll adore it. Your NaNo excerpt is amazing!! Oh my gosh I need more of that story. And it looks like you're doing really well with your word count. Congrats! Hope it keeps going well. Thank you for the tips Amy. I think I need to start scheduling my posts and write them ahead of time. That way my blog won't be inactive for so long. Awww, thank you. <3 Your words mean a lot. I was really terrified of sharing this little bit. That cover for Shadow Rise is so pretty. Great job with NaNo. I wish I had tips for staying on top of blogging. Basically, I just blog while exhausted and have no social life. Congrats on your NaNo project. I get behind on blogging too and then I figure I'll eventually get caught up. 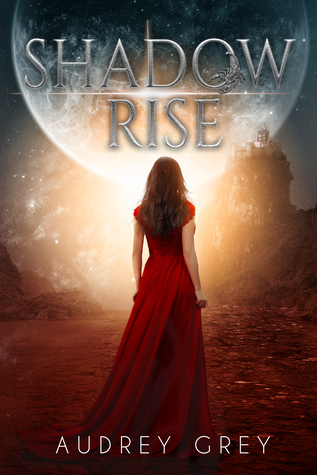 I like the cover for Shadow Rise. Hope you have a great week! I like the cover of Shadow Rise too. As for reading - I always have a book except when working, eating and sleeping (although sometimes I fall asleep listening). I just keep plugging to get the reviews done. I get behind in updating other parts of my blog though. All of it is determined juggling so I don't feel the chaos. Hope you don't stress. Happy Reading! I liked the excerpt! :) good work. Congrats on getting the book! And that conference you went to sounds really cool. I'm still playing catch up on my blog from when I was traveling and away from my computer. I just try to do a little each day in hopes that I'll gradually get caught up. Thankfully people are patient and know that sometimes life gets in the way of blogging. Getting to present an essay at a conference sounds like such an incredible experience! I hope to catch up because there are so many interesting posts out there that I need to find time to read. It was an incredible experience. It's only the second time that I present an essay at a conference, but this newbie is enjoying it.